Aims: The aim of this study is to analyze the role of wavefront analysis as an additional tool for the detection of keratoconus in three groups of patients (i.e., simple refractive errors, high astigmatism, and keratoconus). Design: This study was a prospective comparative study. Patients and Methods: In this prospective comparative study, a total of 115 eyes of 62 patients were examined. All the patients had a complete examination done, which included best spectacle-corrected visual acuity, slit-lamp and fundus examination, and corneal topography for diagnosis of keratoconus. Higher-order aberrations (HOAs) (coma, spherical aberration, and trefoil) were examined using Tscherning aberrometer, based on WaveLight® analyzer II. Statistical Analysis: The one-way analysis of variance test was used. Results: Spherical aberrations were reported highest in the patients with high astigmatism (mean value: 0.149), which was statistically significant when compared to simple refractive errors (P = 0.046). Trefoil aberrations were reported highest in patients with high astigmatism group (mean value: 5.579) in comparison to the other two groups (i.e., simple refractive errors and keratoconus) but were not statistically significant (P > 0.05). Coma and total aberrations were reported highest in keratoconus group (mean value: 0.314 and 2.058, respectively) in comparison to other groups (i.e., simple refractive error and high astigmatism), which was found to be highly significant (P = 0.000). Root-mean-square values of Zernike coefficient polynomials up to the third order were analyzed. Conclusions: This study highlights that assessment of HOAs using wavefront analysis can be used as an additional tool in the early diagnosis of keratoconus in addition to other standard methods. In general, the diagnosis of keratoconus is based on clinical examination, refraction, corneal topography, and elevation-based topography with Pentacam. Additional diagnostic modalities include other tests such as pachymetry and keratometry., Corneal topography using placido disk-based videokeratography surveys only the anterior corneal surface and the findings differ as it is dependent on reference point or viewing angle.,, In pachymetry, the accuracy of contact ultrasonic pachymetry is operator dependent as noted by de Sanctis et al. The purpose of the study was to examine if it was possible to assess HOAs such as coma and trefoil to help detect early keratoconus from normal cornea through diagnostic modality like wavefront analysis. The first publication on keratoconus detection from corneal topography height data using components of a Zernike expansion showed that it was more effective than existing indices based on inferior–superior (I–S) power asymmetry. Tscherning aberrometry is based on Tsherning's principle where a parallel, double-pass technique using forward projection of laser beams is utilized. The beams are generated using a wide laser beam passing through a screen with a large number of spherical holes, and the image of Tscherning screen is projected onto the retina forming a spot pattern. These rays produce individual retinal spots, which are then imaged onto the sensor of a low-light charge-coupled device camera by indirect ophthalmoscopy. The deviations of all the spots from ideal positions are measured by means of personal computer, and the HOAs were calculated in the form of Zernike polynomials. The aim of the study was to analyze the role of wavefront analysis as an additional tool in detecting keratoconus by measuring HOAs in three groups of patients with simple refractive errors, high astigmatism, and keratoconus. This study was conducted for 4 months, and a total of 115 eyes of 62 patients scheduled for refractive surgery were analyzed. Of the 115 eyes selected, 75 eyes had simple refractive error (≤1.5D), 24 eyes had high astigmatism (≥1.5D), and 16 eyes had topographically detected keratoconus (moderate keratoconus keratometry, keratometry <52D), which were accordingly categorized into three groups. Both males and females were included in this study, with age group ranging from 10 to 49 years. All the patients underwent a full ophthalmological examination that included best spectacle-corrected visual acuity, slit-lamp and fundus examination, and corneal topography. The diagnosis of keratoconus was based on topography findings and Scheimpflug imaging. Patients with corneal scars were excluded from the study. The diagnosis was confirmed based on the associated placido-based topographic patterns described by Rabinowitz. Informed consent was obtained from all the patients. The patients were dilated using a combination of tropicamide and phenylephrine drops. HOAs were measured from the 6.5-mm optical zone using the Tscherning aberrometer (Analyzer II from WaveLight ®). 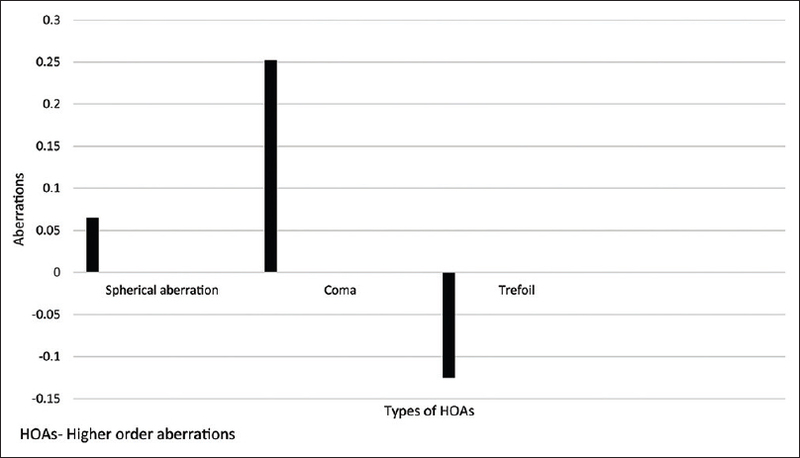 HOAs that were considered were total aberration coefficient, spherical aberration, coma, and trefoil. HOAs were studied using a Tscherning aberrometer, and the individual aberrations in each group were statistically compared with the other two groups. Root-mean-square (RMS) values of Zernike coefficient polynomials up to the fourth order of spherical aberration, coma, trefoil, and total aberration coefficient were analyzed. A total of 115 eyes (62 patients), ranging from 10 to 49 years of age (with the highest number of patients falling in the range of 20–29 years [i.e., ]), were included in this study. Of these 115 eyes, 75 eyes were suffering with simple refractive error, 24 with high astigmatism, and 16 with keratoconus (categorized into three groups). P< 0.05 was considered as statistically significant. HOAs were studied in the three groups as depicted in [Figure 1], [Figure 2], [Figure 3]. 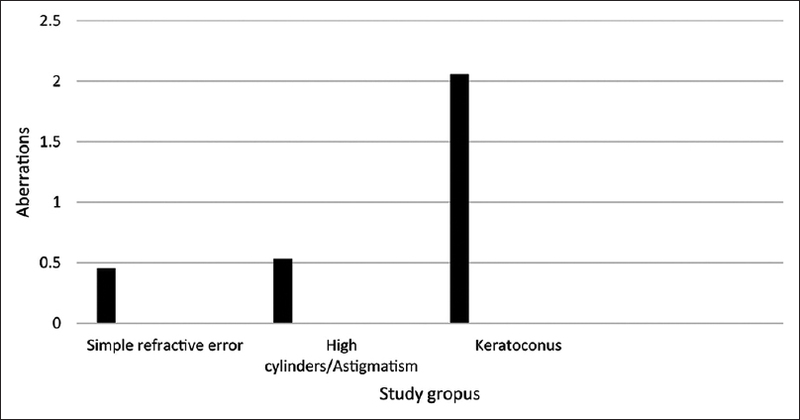 Among the three groups, coma was found to be highest in keratoconus as depicted by one-way analysis of variance test. However, trefoil was relatively high in the high astigmatism group when compared to the other two groups (i.e., simple refractive error and keratoconus group). When total aberrations were compared in the three groups, i.e., simple refractive error, high astigmatism, and keratoconus, highest total aberrations were reported in the keratoconus group [Figure 4]. The three individual HOAs – spherical aberration, coma, and trefoil – were studied separately among the three different groups (i.e., simple refractive error, high astigmatism, and keratoconus). After comparing spherical aberration in simple refractive error and astigmatism group, the aberrations were found to be significant (P = 0.046). However, when aberration was compared between simple refractive error and keratoconus group, (P = 0.485) it was found to be statistically insignificant [Figure 5]. Higher trefoil aberrations were seen in the high astigmatism group when compared to other two groups (i.e., simple refractive error and keratoconus group), which was statistically insignificant (P = 0.07) [Figure 6]. Coma was highest in the keratoconus group, which was highly significant (P = 0.000) in comparison to the other two groups [Figure 7]. When further vertical coma was compared with horizontal coma in the keratoconus group, vertical coma was greater than horizontal coma, which was statistically significant (P = 0.000) [Figure 8]. 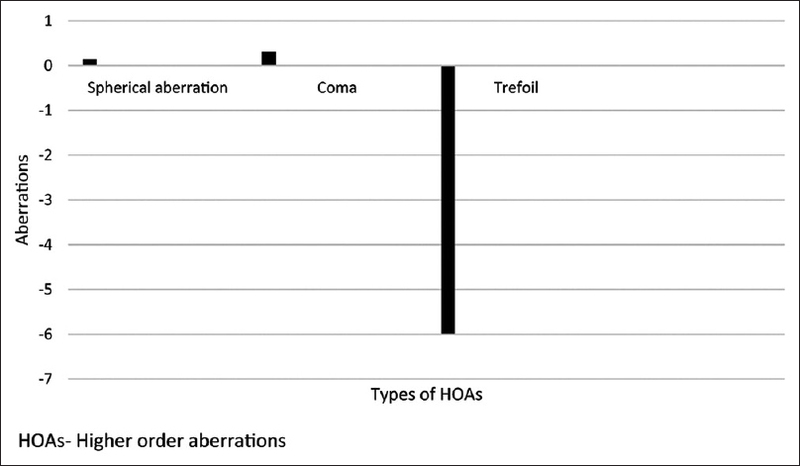 HOAs are optical aberrations that form about 15% of the total aberrations in the human eye. These aberrations produce vision problems such as blurring, halos, difficulty in vision at night, starburst patterns, or double vision (diplopia). In the field of optics, HOAs are defined as those wavefront aberrations that describe Zernike polynomials above the second order, and it includes coma, trefoil (third-order Zernike terms), and spherical aberration (fourth-order Zernike terms). Zernike polynomials are mathematical terms used to describe wavefront aberrations, i.e., optical aberrations that prevent correct focusing of light rays on the retina, resulting in blurred or distorted images. Wavefront technology is utilized in the field of optics to produce accurate measurements and diagnosis of HOAs. Keratoconus eyes with abnormal corneal conditions possess high values of HOAs, which are approximately 5–6 times higher when measured as higher-order RMS wavefront errors compared to normal eyes. Early detection of keratoconus is critically important in patients scheduled for corneal refractive surgery  as it is a significant risk factor for the development of postsurgery ectasia, as noted by Goebbe et al. Our study was carried out using Tscherning aberrometer to measure HOAs in eyes having simple refractive errors, high astigmatism, and keratoconus, using a wavefront analyzer based on Tscherning aberroscope. The results of our study demonstrated that total aberrations were significantly higher in keratoconus group (approximately four times) as compared to simple refractive error group and astigmatism group. This is in accordance to a similar study by Pantanelli et al., which reported keratoconus eyes had approximately 5.5 times HOAs more than normal eyes. 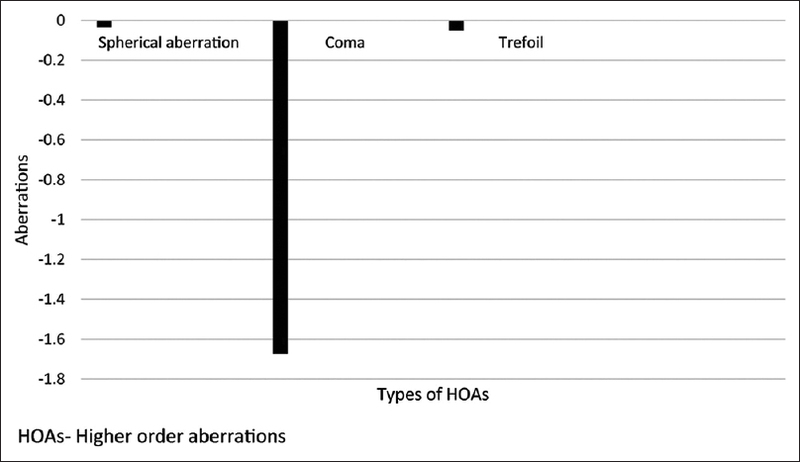 In addition, among the three HOAs studied, coma-like aberrations were significantly higher in keratoconus group as compared to the two other groups included in this study. When compared to the results of Maeda et al., who used the Hartmann–Shack sensor despite its limitation (e.g., inability to register in highly aberrated eyes, limited to the pupil area, and the influence of ocular internal aberrations), the results of the present study were similar regarding significantly higher corneal aberrations in keratoconic eyes compared to normal eyes. These findings are also supported by previous studies by Alió and Shabayek, which reported that coma-like aberrations were significantly higher in eyes having keratoconus when compared to normal eyes. In this study, vertical coma was significantly higher in the keratoconus group than horizontal coma. The predominance of vertical aberrations in keratoconus eyes is due to the increase in topographic indices such as the I–S index or surface asymmetry index, indicating that vertical coma can serve as a valuable aid in detecting keratoconus in suspected patients. Gobbe et al. in their study showed that the vertical coma is the best indicator for differentiating corneas with suspected keratoconus from normal corneas. In the current study, the total HOAs were higher in the keratoconus patients when compared to other two groups having simple refractive errors and high astigmatism. This study highlights that assessment of HOAs using wavefront analysis can be used as an additional tool in the early detection and diagnosis of keratoconus in addition to other standard methods. Assessment of coma-like aberrations is a good indicator for early detection and grading of keratoconus, and therefore can be used as an additional tool in the diagnosis of keratoconus. The keratoconic eyes are shown to possess increase of ocular HOAs when compared to normal eye, which is due to the increase of corneal HOAs. Studies on wavefront analysis were carried out for evaluating the quality of eye vision and also for differentiating keratoconic eyes from normal eyes by analyzing the characteristics of the HOAs. Coma-like aberrations were found to be dominating when compared to spherical-like aberrations, and therefore proved to be good indicators for early detection of keratoconus in patients' eyes. Vertical coma was higher than horizontal coma and was statistically significant. This article was presented at “The Annual ASCRS and ASOA Symposium and Congress”, held at Boston, USA, on April 28, 2014. Abu-Amero KK, Al-Muammar AM, Kondkar AA. Genetics of keratoconus: Where do we stand? J Ophthalmol 2014;2014:641708. Vazirani J, Basu S. Keratoconus: Current perspectives. Clin Ophthalmol 2013;7:2019-30. Feizi S, Einollahi B, Raminkhoo A, Salehirad S. Correlation between corneal topographic indices and higher-order aberrations in keratoconus. J Ophthalmic Vis Res 2013;8:113-8. Seiler T, Quurke AW. Iatrogenic keratectasia after LASIK in a case of forme fruste keratoconus. J Cataract Refract Surg 1998;24:1007-9. Rabinowitz YS. Keratoconus. Surv Ophthalmol 1998;42:297-319. Rabinowitz YS. Videokeratographic indices to aid in screening for keratoconus. J Refract Surg 1995;11:371-9. Ambrósio R Jr., Klyce SD, Wilson SE. Corneal topographic and pachymetric screening of keratorefractive patients. J Refract Surg 2003;19:24-9. Konstantopoulos A, Hossain P, Anderson DF. Recent advances in ophthalmic anterior segment imaging: A new era for ophthalmic diagnosis? Br J Ophthalmol 2007;91:551-7.
de Sanctis U, Missolungi A, Mutani B, Richiardi L, Grignolo FM. Reproducibility and repeatability of central corneal thickness measurement in keratoconus using the rotating Scheimpflug camera and ultrasound pachymetry. Am J Ophthalmol 2007;144:712-8. Maeda N, Fujikado T, Kuroda T, Mihashi T, Hirohara Y, Nishida K, et al. Wavefront aberrations measured with Hartmann-Shack sensor in patients with keratoconus. Ophthalmology 2002;109:1996-2003. Fontes BM, Ambrósio R, Velarde GC, Nosé W. Ocular response analyzer measurements in keratoconus with normal central corneal thickness compared with matched normal control eyes. J Refract Surg 1995;27:209-15. Schwiegerling J, Greivenkamp JE. Keratoconus detection based on videokeratoscopic height data. Optom Vis Sci 1996;73:721-8. Oliveira CM, Ferreira A, Franco S. Wavefront analysis and Zernike polynomial decomposition for evaluation of corneal optical quality. J Cataract Refract Surg 2012;38:343-56. Resan M, Vukosavljević M, Milivojević M. Wavefront aberrations. Adv Ophthamol 1999;28:191-204. Sabesan R, Yoon G. Neural compensation for long-term asymmetric optical blur to improve visual performance in keratoconic eyes. Invest Ophthalmol Vis Sci 2010;51:3835-9. Alió JL, Shabayek MH. Corneal higher order aberrations: A method to grade keratoconus. J Refract Surg 2006;22:539-45. Gobbe M, Guillon M. Corneal wavefront aberration measurements to detect keratoconus patients. Cont Lens Anterior Eye 2005;28:57-66. Pantanelli S, MacRae S, Jeong TM, Yoon G. Characterizing the wave aberration in eyes with keratoconus or penetrating keratoplasty using a high-dynamic range wavefront sensor. Ophthalmology 2007;114:2013-21. Wali UK, Bialasiewicz AA, Al-Kharousi N, Rizvi SG, Baloushi H. Subjective and quantitative measurement of wavefront aberrations in nuclear cataracts – A retrospective case controlled study. Middle East Afr J Ophthalmol 2009;16:9-14.